Description - The male Red-Winged Blackbird is a glossy black with red shoulder patches which are tipped with a buffy-yellow. The female is dark brown above, heavily streaked below and sometimes has a red tinge on the wing coverts or a pinkish wash on the chin and throat. A rich, musical "o-ka-leeee!" characterizes the voice of this bird. Distribution - The red-winged blackbird breeds from Alaska east across Canada and south from northern Baja California to Florida. Wintering grounds range across the U.S.A. north to British Columbia. They inhabit marshes, swamps, pastures and wet and dry meadows. 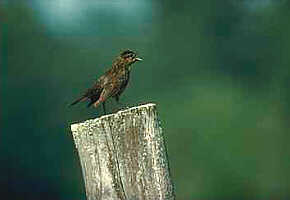 Biology - Red-winged blackbirds feed on insects, small fruits, seeds, waste grain and small aquatic life. Often regarded as pests because they consume grain in cultivated fields, the farmer actually benefits because of the blackbirds consumption of harmful insects. A typical nest of the red-winged blackbird is a well-made cup of marsh grass or reeds which is attached to growing marsh vegetation or in a bush in a marsh; it contains 3-5 pale blue eggs, spotted and scrawled with dark brown and purple.